Famed music video director, Mark Romanek, takes on Kazuo Ishiguro’s much loved and heavily praised novel, NEVER LET ME GO, as his second venture into feature filmmaking. It is a daring challenge indeed given the underlying questions about the value of human life but Romanek takes the challenge head on. I have not read the novel but, from what I understand, he gets the tone just right. That said, if the tone is meant to be one of cold disassociation, than perhaps it was never meant to be a film to begin with. 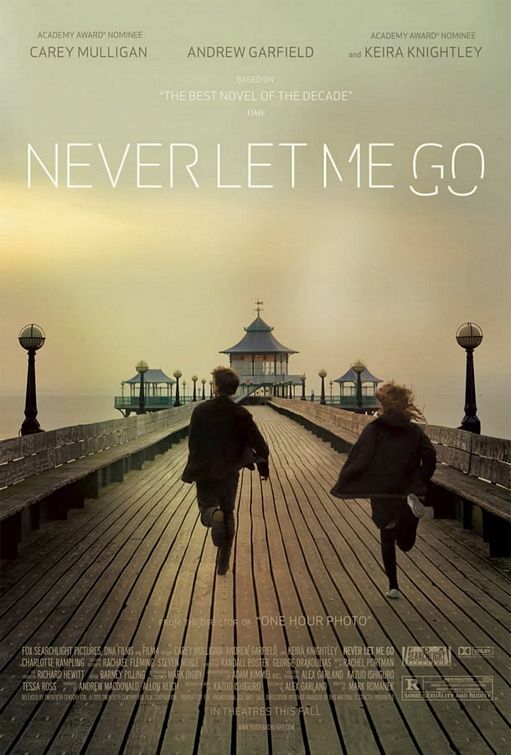 NEVER LET ME GO is a hybrid of science fiction and romantic drama. The prologue to the film tells us that a medical breakthrough discovered in 1967 has increased the life expectancy of human beings to over 100 years but does not tell us how. We are then introduced to Kathy, Tommy and Ruth (Carey Mulligan, Andrew Garfield and Keira Knightley, respectively) in 1978 at a boarding school called Hailsham. There is clearly something special about this school and the children that go there and it is our job to piece that together bit by bit. While that is happening though, a love triangle develops between these friends that is meant to be this great affront to love. It seems secondary to the mystery awaiting us and therefore never feels meaningful even after the mystery is solved. When a younger Kathy sits on her bed, listening to fictional singer, Judy Bridgewater, sing, “Never, never, never let me go,” she cries quietly to herself and yearns to know what that feels like. She looks human, she emotes like a human but she knows she isn’t like everyone else. Watching the film, NEVER LET ME GO, is perhaps best exemplified in this scene. Like the little girl, it too wants to be held and cherished, for its beautiful imagery and solid performances, but whether or not that is even possible is up for debate. Again, like the little girl, the film too might be lacking a soul.